The Median Nerve extends along the middle of the arm and forearm to the hand. It arises by two roots, one from the lateral and one from the medial cord of the brachial plexus; these embrace the lower part of the axillary artery, uniting either in front of or lateral to that vessel. Its fibers are derived from the sixth, seventh, and eighth cervical and first thoracic nerves. As it descends through the arm, it lies at first lateral to the brachial artery; about the level of the insertion of the Coracobrachialis it crosses the artery, usually in front of, but occasionally behind it, and lies on its medial side at the bend of the elbow, where it is situated behind the lacertus fibrosus (bicipital fascia), and is separated from the elbow-joint by the brachialis. In the forearm, it passes between the two heads of the Pronator teres and crosses the ulnar artery, but is separated from this vessel by the deep head of the Pronator teres. It descends beneath the Flexor digitorum sublimis, lying on the Flexor digitorum profundus, to within 5 cm. of the transverse carpal ligament; here it becomes more superficial and is situated between the tendons of the Flexor digitorum sublimis and Flexor carpi radialis. With the exception of the nerve to the Pronator teres, which sometimes arises above the elbow-joint, the median nerve gives off no branches in the arm. As it passes in front of the elbow, it supplies one or two twigs to the joint. communicates with the volar branch of the lateral antibrachial cutaneous nerve. Is a common condition that causes a tingling sensation, numbness and sometimes pain in the hand and fingers. These sensations usually develop gradually and start off being worse during the night. They tend to affect the thumb, index finger and middle finger. AINS is a pure motor neuropathy, as the anterior interosseous nerve contains no sensory fibres; dull forearm pain is however sometimes mentioned by patients. Typically, patients fail to make an “O.K.”-sign, as flexion of the interphalangeal joint of the thumb and the distal interphalangeal joint of the index finger is impaired. Another sensitive test is the pinch test: a patient with AINS will also not be able to pinch a sheet of paper between his thumb and index finger, instead of clamping the sheet between his extended thumb and index fingers, akin to a tong rather than a clamp. The weakness of the pronator quadratus muscle manifests itself in pronation weakness with a flexed elbow. Due to the position of this muscle that sits over your median nerve, the pressure on the nerve can elicit pain while hindering your forearm movement. It occurs when your pronator teres muscle becomes tight or overworked, compressing the median nerve. Hammering, repeatedly using a screwdriver, cleaning fish can lead to overuse of the pronator teres. Symptoms include pain and reduced mobility. Carpal Tunnel Syndrome symptoms are often confused with PTS, however in this case symptoms worsen with elbow movements. The median nerve is particularly vulnerable to damage at the elbow and wrist. Most common injury = Supracondylar fracture of the humerus. This results in the flexors and pronators in the forearm being paralysed, with the exception of the flexor carpi ulnaris and medial half of flexor digitorum profundus. The forearm constantly supinated, and flexion is weak (often accompanied by adduction, because of the pull of the flexor carpi ulnaris). Flexion at the thumb is also prevented, as both the longus and brevis muscles are paralysed. 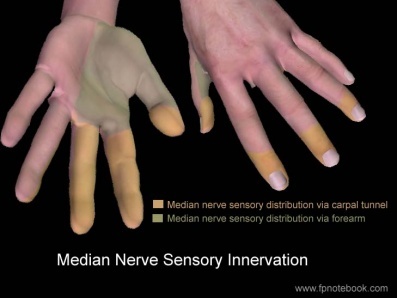 Sensory functions: Gives rise to the palmar cutaneous branch, which innervates the lateral part of the palm, and the digital cutaneous branch, which innervates the lateral three and a half fingers on the anterior (palmar) surface of the hand. The lateral two lumbrical muscles are paralysed, and the patient will not be able to flex at the MCP joints or extend at IP joints of the index and middle fingers. So on trying to flex the fingers and thumb to make a fist, the 1st 3 digits remain in extension, and the posture is known as the "hand of benediction". NB In lesions of the Ulnar Nerve the same posture occurs with the hand at rest, due to paralysis of the medial lumbricals. In these cases, it is known as the "ulnar claw". Most common injury = Lacerations just proximal to the flexor retinaculum. Motor functions: Thenar muscles paralysed, as are the lateral two lumbricals. This affects opposition of the thumb and flexion of the index and middle fingers. Sensory functions: Same as an injury at the elbow. Characteristic signs: Same as an injury at the elbow, i.e. hand of benediction on attempting to make a fist. - sensory distribution includes thumb, radial 2 1/2 fingers, and the corresponding portion of palm. Extending the elbow and wrist, two key components of the upper limb tension test, puts the median nerve under tension. Rotating the head and neck to the opposite side puts the nerve under increasing stretch. If the entrapment is in the inter scalene triangle then raising the arm above the head usually increases the response. The purpose is to test for C5, C6, C7 nerve roots and median nerve as the source of the patient’s painful shoulder and arm. ↑ Wolny T, Saulicz E, Linek P, Shacklock M, Mysliwiec A. Efficacy of Manual Therapy Including Neurodynamic Techniques for the Treatment of Carpal Tunnel Syndrome: A Randomized Controlled Trial. J Manipulative Physiol Ther. 2017.